Do police provide a public good or do they perpetuate racial inequality? 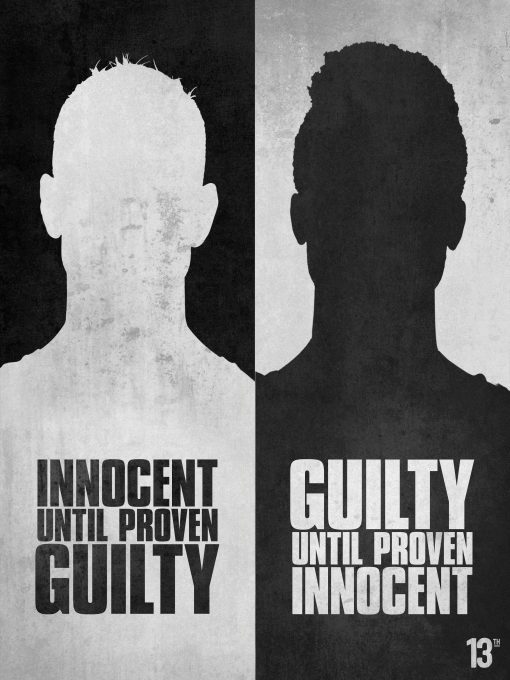 Like most institutions, they do both. Nonetheless, thanks to the tragic deaths of Michael Brown, Eric Garner, Rekia Boyd, Tamir Rice, and hundreds of others, this blunt question remains at the heart of political debate. Social movements like Black Lives Matter (BLM) and Say Her Name, focused on civilian deaths at the hands of cops, have changed national discourse around what cops should be doing—and how they should do it. Of course, social movements inspire responses. 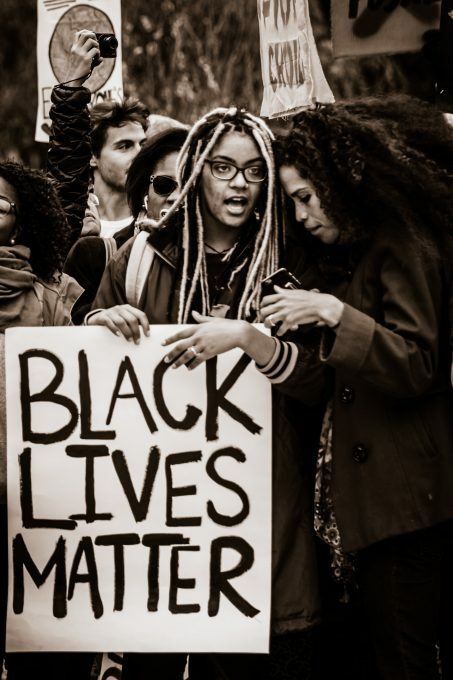 Two slogans, in particular, are especially indicative of negative reactions to BLM: “All Lives Matter” and “Blue Lives Matter.” The first assumes that BLM suggests that Black lives matter more than others, while the latter asserts that critiques of the police, such as those lodged by BLM, have created a backlash—sometimes called the “Ferguson effect” in reference to Mike Brown’s death in Missouri—that feeds mistrust and hampers policing, incites violence against police officers, and makes everyone less safe. If the core divide between Black Lives Matter and All/Blue Lives Matter is whether Black people are more likely to experience violence at the hands of police than other Americans, then we need to know the answer.If the core divide between Black Lives Matter and All/Blue Lives Matter is whether Black people are more likely to experience violence at the hands of police than other Americans, then we need to know the answer. As sociologists of race and crime, we were surprised to discover that there have been few systematic analyses of disparities in police use of force. Among those, none examines the specific intersectional claims made by activists on both “sides” of the issue. One big reason is a lack of good data—government data and crowd-sourced data like that produced by the newspaper The Guardian’s project, “The Counted,” consider only deaths or shootings at the hands of the police. Without a comparison group (such as non-fatal police encounters) and without adjusting for completing explanations for variations in victimization, it is hard to draw any meaningful conclusions. Fortunately, there is an alternative data source: New York Police Department (NYPD) records all investigatory civilian stops, regardless of whether or not they involve the use of force. We harness these city-wide data to investigate whether police use more force against Black individuals (particularly Black youth) than Whites and whether and how gender factors into this equation. Despite sustained outrage around police use of force on Black bodies, research has lagged. For instance, just because “The Counted” finds that Black people were more likely than Whites to be killed by police in 2016, it does not necessarily mean that police are racially biased. Perhaps the most common justification police offer for the overrepresentation of Black victims in use of force incidents is that it follows from racial disparities in crime rates. In this scenario, if police use of force is random across civilian interactions, but Blacks commit more crime, any racial disparities in shootings could very well be the result of Blacks’ greater contact with police. It’s a simple, if stereotypical and damaging, narrative, and it shows why it is imperative that any estimates of disparities in police violence adjust for crime rates by race. Further, in each of the most infamous recent deaths in connection with law enforcement, there have been other aspects of the interaction that proponents of All Lives Matter or Blue Lives Matter wield as their explanations for why the situation ended in violence. In Missouri, officer Darren Wilson described Michael Brown as being so physically large that his body alone was construed as a deadly weapon; New York City’s Eric Garner was accused of being non-compliant as officer Daniel Panteleo attempted to handcuff Garner, thus Panteleo had to use what would become a fatal chokehold; and Freddie Gray was stopped, beaten, and arrested in a high-crime, high-poverty, and predominantly Black neighborhood—just the kind of neighborhood the Blue Lives Matter folks insist are particularly dangerous to police. Importantly, any explanation is post-hoc; it may be true, it may be false. After all, North Charleston police officer Michael Slager insisted that Walter Scott had been threatening his life, but video evidence shows Scott being shot while running away. If even after adjusting for all of these potential explanations, including any civilian behavior that inspired the stop, where and when the stop occurred, local crime rates, and neighborhood poverty and racial demographics, we still find evidence of disparities in police violence, then BLM’s critiques of over-policing and over-use of force against Black Americans would gain powerful empirical support. We are not the first to use police records to study BLM critiques, but data limitations prevent most from accounting for more than one or two competing explanations. As an exception, economist Roland Fryer made quite a media splash when he found no evidence of racial bias in police shootings (though he did find evidence of bias in lesser forms of police violence). But in his analyses, Fryer compared police shootings to police encounters in which the officer could have been justified in shooting but did not (such as when a civilian is resisting arrest). Sociologists know, however, that such arrests are themselves racialized: officers are more likely to perceive people of color as aggressive or noncompliant compared with Whites and, as such, are more likely to arrest them on such a charge. In short, Fryer obscured racial bias in shootings by using a biased comparison group in that part of his project. The question remains: are there racial disparities in police use of force, even after we consider justifications? As part of a 1999 settlement agreement in Daniels et al v. City of New York, New York City agreed to make public detailed data on all civilian stops executed by NYPD officers under its highly-contested stop-and-frisk policy. These reports, based on officers’ own reports, are the best available data for studying racial disparities in policing. In fact, their release contributed to a federal judge’s 2013 ruling that New York City’s stop-and-frisk policy was racially discriminatory. Thereafter, the NYPD dramatically reduced the number of its civilian stops and revised training and policies toward more civil, less confrontational community interactions. The changes mean we can now see whether police tactics and training matter in reducing disparities in police violence. Or, to be a bit more wonky, can organizational change reduce victimization inequalities in police officers’ use of force?We need better data to understand the problem we want to solve. With data from 3.3 million NYPD investigative pedestrian stops conducted between 2007 and 2014, supplemented by U.S. Census and crime data provided by the New York City Division of Criminal Justice Services, we directly tested whether policy and training changes affected associations between race, stops, and violence. In addition, as BLM makes intersectional claims that Black children (like 12-year-old Tamir Rice who was shot to death by Cleveland police) are more likely to experience police force than are White children and that Black women (like Korryn Gaines, a Maryland mother shot by police after earlier violent interactions) are more likely than White women to endure the experience. Since deaths at the hands of police are rare (in 2013, NYPD shot and killed a total of 8 people), we examined incidents in which police pointed a firearm at a civilian, which occurred in less than one percent of all stops (police are trained to only draw their guns when prepared to use lethal force). To broaden our lens as much as possible, we then considered any use of force by police, ranging from “hands on suspect” to “pointing firearm at suspect.” We then adjusted our estimates for every justification for police use of force put forward to date. We find gaping inequalities in police violence. 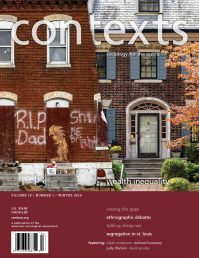 Black people are more likely than Whites to be subject to police violence—regardless of whether they are doing anything illegal, the time of day, their height, their age, their gender, their behavior during the stop, the police justification for the stop, neighborhood socioeconomic and racial characteristics, the precinct’s stop rate, or local arrest rates broken down by race. In fact, the majority of stops in which police used force against Black individuals did not lead to arrest or the discovery of any contraband. Even as scholars well versed in racial disparities in criminal justice contacts, we were surprised by the sheer number of young Black children in our data. 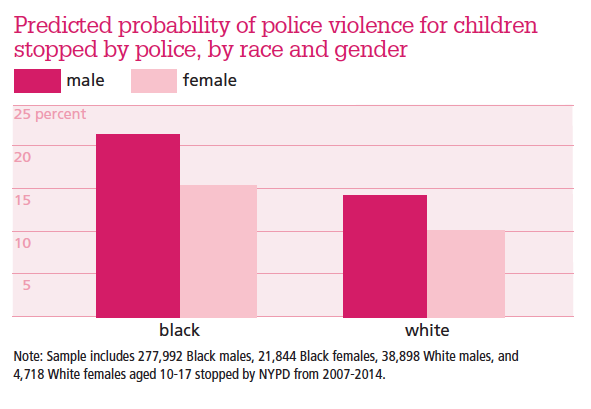 On average, more than seven Black children aged 10-13 were stopped by police in New York City each day between 2007 and 2014 (approximately 20,000 stops). More Black teens experienced police violence during a stop than did Whites of all ages combined.We find gaping inequalities in police violence. Even as scholars well versed in racial disparities in criminal justice contacts, we were surprised by the sheer number of young Black children in our data. When we add controls, including teens’ behavior during police stops, when and where they were stopped, and whether or not they were arrested, the racial disparity in police violence persisted. We have long known that young Blacks are more likely to be stopped, but our results show that this disparity extends to police violence. The first figure above plots the association between race, age, and the likelihood of experiencing force once stopped across our entire sample. Overall, and at any age, Black individuals stopped by police are more likely to experience force (including an officer drawing and/or pointing a gun). The racial gap is largest among youth: stops of Black youth are more likely than those of White youth to include force, though the effect shrinks, albeit only slightly, with age. Although we don’t know for sure why the likelihood of experiencing police violence declines with age, it may be that Black men have simply had more time to learn how to navigate police encounters and decrease the likelihood of enduring police violence. Importantly, these results hold even after adjusting for police justifications and a host of variables in stops. 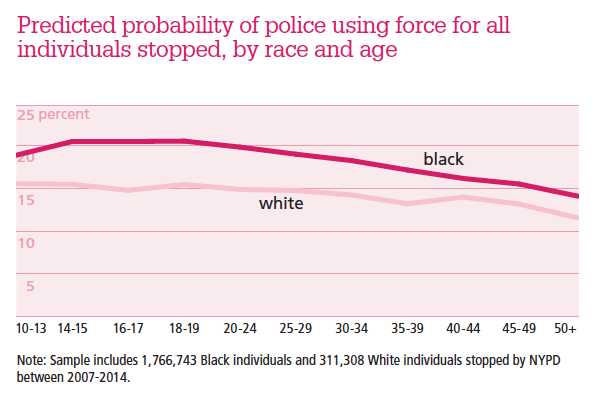 To highlight the experience of Black youth, the second and third figures show the predicted probability that police will use force or draw a firearm during a stop with underage (above) Black and White civilians (ages 10-17), split by gender (again, this data holds after adjusting for the circumstances of the stop). Consistent with work by social psychologists, such as Philip Goff who has shown that Black youth are perceived as older and more threatening than White youth of the same physical size and age, we find bias. The figure below shows that Black youth are 41% more likely to be victims of any police use of force than comparable White youth. Sadly, the patterns are similar when we predict stops in which officers pull their guns and are prepared to shoot—Black youth are more than 50% more likely than White youth in similar stops to find themselves staring down the barrel of a gun. So Tamir Rice and Tyre King, aged 12 and 13, are not tragic outliers, but important examples of a systematic pattern of racial inequality in police violence. We also tested Say Her Name activists’ critique that Black women are more likely than White women to experience police violence and that such violence is especially unlikely to be covered in debates about police violence. We have shown predicted probabilities for girls ages 10-17, but the findings hold across all age groups in our sample. Although women overall experience fewer stops than men, Black women are more likely to experience police use of force—including having a gun drawn on them—during a stop than White women, even after accounting for alternative explanations. And Black girls’ predicted probability is about the same as White boys’ (15% to 14% respectively). 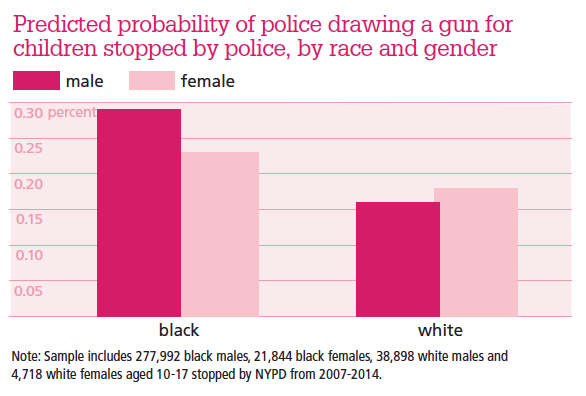 Within race, gender is not associated with a difference in police drawing guns during a stop (see above); in other words, it’s about as likely that a Black woman or a Black man will have a gun drawn on them, and the same holds for Whites. Taken together, we find that gender influences whether force is used with adults, but does not affect whether police draw and/or aim their guns at children. The history of policing is intimately linked to the history of racial subjugation. Even though today’s police officers and those in leadership roles are more diverse than even a few decades ago, police—and citizens—have not escaped the institution’s legacy of racially disparate violence. Not only do police stop people at different rates according to their race, age, and gender, but they also behave differently during otherwise similar interactions. 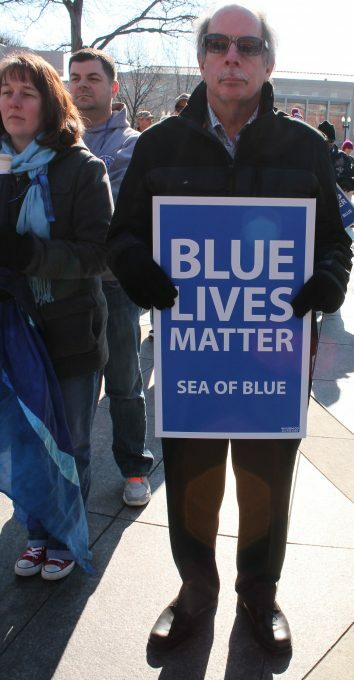 An attendee at a January 2015 End the Madness/Sea of Blue march in Washington, D.C. Photo by Elvert Xavier Barnes, elvertbarnes.com. There is scant evidence to support stop-and-frisk as a crime-fighting strategy in New York City. As Mayor Bill De Blasio tweeted, “We’ve reduced stop-and-frisk by 97% in New York City and crime is down significantly. Not everyone knows that.” Moreover, we find that when the NYPD reduced the use of stop-and-frisk and instituted changes in officer training in late 2013—due in part to the policy being ruled unconstitutional—police used force less frequently in all stops. Still, the racial disparity in who is subjected to force did not shrink. The below shows the Black-White disparity in use of any force and in gun use in the periods before and after stop-and-frisk reform. 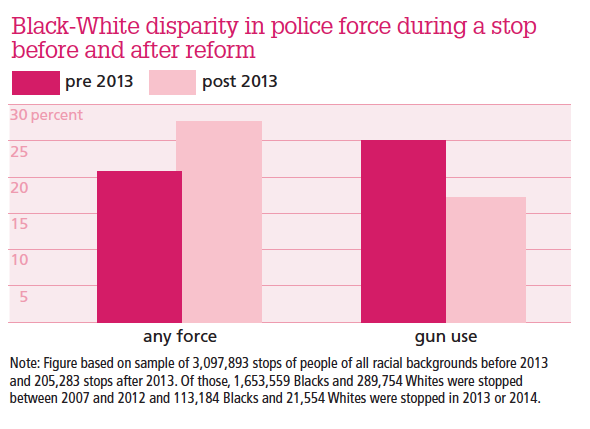 The racial disparity in police violence of any type grew after the NYPD’s 2013 reform. This is because use of force declined more dramatically for Whites than Blacks, widening the violence gap even as violence, overall, decreased in police interactions. In better news, there are hundreds of thousands fewer stops made by NYC cops, the rate of force has declined for both Black and White civilians, and, perhaps most importantly, the 2013 reforms shrank racial inequities in police gun violence. But that race is no longer a significant predictor of whether a NYPD officer will draw a firearm in a citizen interaction owes to a change in how and how often NYPD officers stop civilians, rather than to any “disappearance” of racial inequality in policing and use of force. Given these findings, there is no good reason for any police department to pursue stop-and-frisk. There is growing evidence that it sours public perceptions of police, especially in communities of color, which have been treated violently by powerful institutions since the very birth of the country. Conversations need to shift from whether there are racial disparities in policing to what can be done to reduce or eliminate racial disparities in policing. Our findings suggest that policy changes such as New York City’s discontinuation of stop-and-frisk practices and the revision of police training courses are promising avenues, at least with regard to disparities in gun use and in reducing the sheer quantity of force used. Because police force is not restricted to investigatory pedestrian stops, police training and policy also deserves a much broader reconceptualization; currently, officer training modules prioritize weapons training over de-escalation techniques. However, law enforcement agencies like those in Sanford, FL (where Trayvon Martin was killed) are beginning to incorporate implicit bias training programs (to help counter cops’ sense of Black civilians, particularly young, Black males, as threatening), while others have adapted their training and policies to emphasize de-escalation tactics. These steps are vital toward reducing force as a primary tool of policing. Holding police departments and individual officers accountable for disparities in civilian interactions is also critical in improving police-civilian relations. After all, when people don’t trust the police, they don’t call the police; communities and crime victims suffer when they are unable to use law enforcement to enforce the laws meant to protect them.When people don’t trust the police, they don’t call the police; communities and crime victims suffer when they are unable to use law enforcement to enforce the laws meant to protect them. Although many good proposals have been put forward with an eye toward reducing inequalities in police violence, at a basic level, we need better data to understand the problem we want to solve. The FBI, the agency tasked with overseeing systematic data collection, has begun its work with federal agencies in 2017, but we do not yet know when state and local departments will be phased in, which local agencies will agree to share their data (the FBI has said all data collection will be voluntary), nor even the level of detail the FBI will require on each incident. Further, the FBI has announced that information will only be gathered on officer-involved deaths or instances involving “serious bodily injury”. So rather than understanding inequalities, this data collection effort is geared toward obtaining accurate incident counts. As our analysis demonstrates, for public oversight to be effective and to reduce racial inequality, data must consider all police contacts. Unfortunately, as Attorney General Jeff Sessions has already disbanded the National Commission on Forensic Science and questioned the value of consent decrees focused on fixing systemic racial biases in local police forces, we are not optimistic about the role of the federal government in obtaining, releasing, and responding to data on racial disparities in police use of force in the near future. The Center for Policing Equity. July 2016. “The Science of Justice: Race, Arrest, and Police Use of Force.” Compiles data from a nationally representative sample of police departments to identify trends in police use of force and crime rates and finds that the latter cannot explain the former. policingequity.org. “The Counted,” The Guardian. An interactive news organization website tracking all U.S. police killings, including victim and incident details along with stories about their deaths. theguardian.com/us-news/series/counted-us-police-killings. Alternate formats available at thesocietypages.org. Ava Duvernay. 2017. 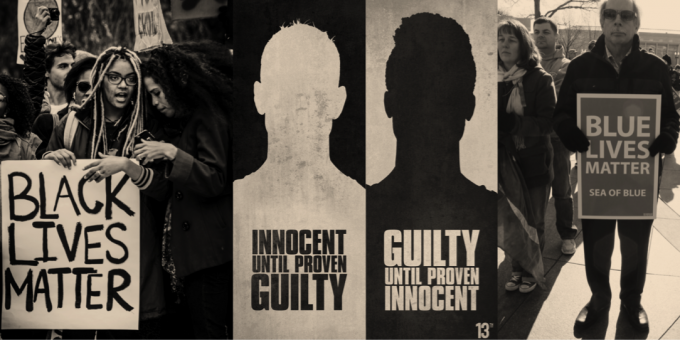 “13th.” Described by The New York Times as “powerful” and “infuriating,” this documentary explores policing as a form of social control, making a provocative argument connecting modern policing to historical slavery and including a section on the morality and use of videos of police brutality to inspire social movements. Charles R. Epp, Steven Maynard-Moody, and Donald P. Haider-Markel. 2014. Pulled Over: How Police Stops Define Race and Citizenship. Chicago, IL: University of Chicago Press. Enhances our understanding of police investigatory stops, racial disparities in the likelihood and experience of such stops, and how police encounters affect perceptions about citizenship and police legitimacy. President’s Task Force on 21st Century Policing. 2015. “Final Report of the President’s Task Force on 21st Century Policing.” Washington, DC: Office of Community Oriented Policing Services. A report commissioned by President Barack Obama after the death of Michael Brown and protests in Ferguson, MO, this document includes academics’ and police chiefs’ recommendations of specific policy proposals to promote police legitimacy and safety. Rory Kramer and Brianna Remster are in the department of sociology and criminology Villanova University. Kramer studies the physical and social boundaries between races in the U.S., and Remster studies inequality, crime, and formal social control. Camille Z. Charles is in the departments of sociology and Africana studies at the University of Pennsylvania. She studies U.S. racial attitudes. Thank you for this. Very readable and easily understood by a total layperson like myself. It's good (but bad) to have the data of what seemed easily intuited. I want to say let's skip the prayers for America and go directly to much-needed policy changes, but then I remember the last election. Ugh. I think we should not be labeled anymore black, white or any race because all lives matter. These protest are okay sometimes. But I think it promotes violence and sometimes police feel threatened by these actions. So they be quick to retaliate if any sign of violence. Very eye opening information. I wonder if these numbers and incident of police bias change in areas where there are more black officers?